You crave control, so here it is: fully-adjustable FOX PODIUM 2.5 RC2 Piggyback shocks, 172 horsepower, and 2 or 4-seats. Drive like a Maverick with unparalleled flexibility on any terrain. JUST BEASTLY: Ready to pay your respects to the king of side-by-side engines? The precision-engineered, industry-leading triple-cylinder Rotax ACE engine pushes 172 horsepower at 7,250 RPM and 124 lb-ft of torque at 6,500 RPM for searing speed, no matter the terrain. Choose your thrill-seeking friends wisely for a ride off-road they’ll never forget. 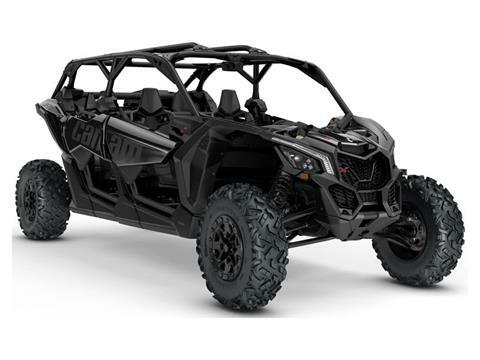 STUNNING STRUCTURE: Our engineers are rightfully proud that the Maverick X3 MAX features an ultralight, rigid chassis made of state-of-the-art Dual-Phase 980 steel. Not only is it strong enough to allow the suspension to do its magic, it’s the most efficient way to both harness 172 horsepower and keep your passengers on lock. PROOF IN THE POUNDING: Can-Am's four-link TTX suspension with 20-in of travel features a trophy truck-like trailing arm and three links dedicated to controlling camber while delivering optimal geometry at all times, even during extended wheel travel. The result? Unparalleled power transfer to wheels, virtually no bump steer, precise steering response, more confidence at higher speeds—and four huge grins. 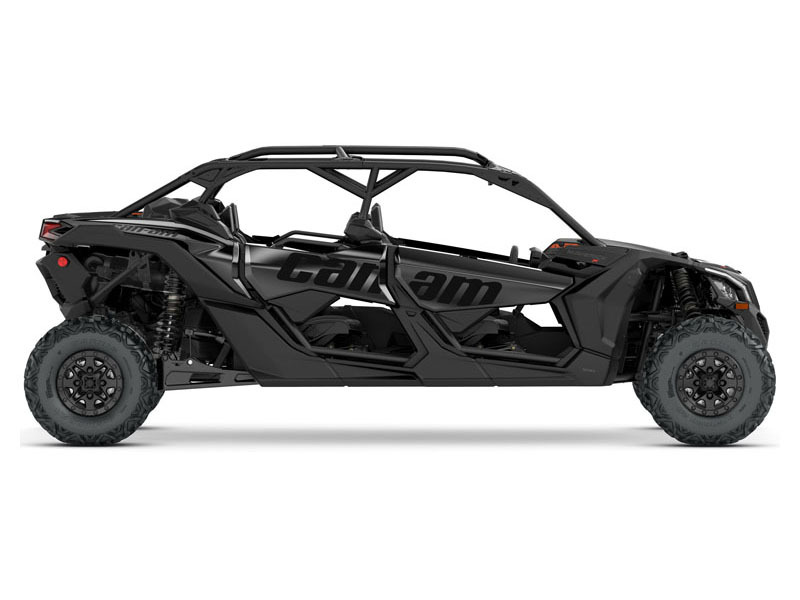 HANDLE IT: With a chassis built to conquer any terrain—and a wheelbase 15% longer than the Polaris RZR XP4—the Maverick X3 MAX is not only at home in rough terrain but comes alive with confidence at high speeds. From its arched double tubular A-Arm and sway bar up front to its race-inspired quick-ratio D-shaped steering wheel, Tri-Mode DPS system, and Intelligent Throttle Control (iTC), it’s handling you should experience for yourself. FIT FOR YOUR PURPOSE: With 18% more seat pitch for rear passengers than the Polaris RZR XP4, plus fore, aft, and height adjustments, anyone in the second row will find the perfect perch for what’s about to unfold. There’s well-placed foot rests to grab handles to its tilt and race-inspired steering wheel, and we’ve even fitted integrated wiring and offer a wide range of factory interior accessories. Better give it a name—this Maverick will be around for a long time. SUIT UP: Its low floor with adult-sized room for both rows ensures everyone feels safely connected to the vehicle’s every move. Its high and dominant posture is enhanced with race car-inspired one-piece molded seats with ideal support, weight distribution, and 4-way adjustablility for all four seats. UNMISTAKABLY FIERCE: The Maverick X3 MAX X ds' intensity comes from a mix of performance-driven mechanical and structural design, from its signature LEDs to its advanced cockpit. 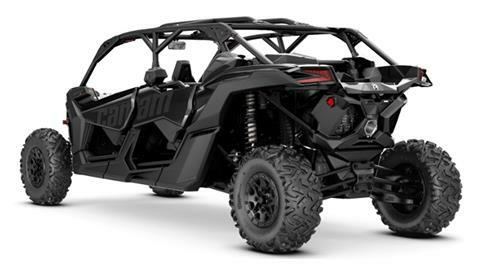 Here, designers have blessed the Maverick X3 X ds with an unmistakable look: in your paint choice of Phoenix Orange or Triple Black or Platinum Satin. OPTIMIZED WHEELS: Keep rolling strong with 14-in cast-aluminum beadlock wheels and 29-in. Maxxis Bighorn 2.0 six-ply tires. Built to withstand rough terrain, sturdy lugs and a non-directional tread pattern ensure a precise, earth-conquering ride. ADJUSTABLE SUSPENSION: The Maverick X3 MAX X ds features fully-adjustable FOX 2.5 Podium RC2 HPG piggyback shocks with front and rear dual-speed compression and rebound adjustments, as well as rear bottom-out control to give the driver flexibility to fit the terrain and preferred driving style. ALL CONDITIONS COVERED: Discover and deal with varying conditions such as desert, dunes, rocks or trails with quarter doors and a dominant vehicle posture for optimal off-road capability with no compromise to line-of-sight, even in the back row.